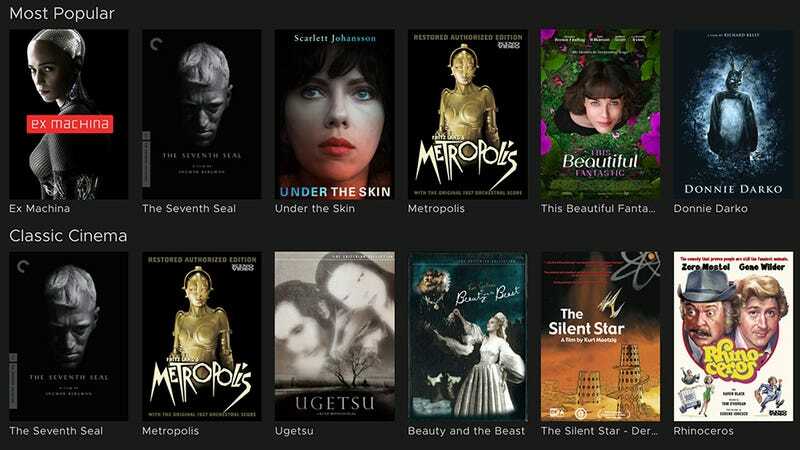 Lovers of classic films have been set adrift this month after the Filmstruck streaming service was unceremoniously murdered by corporate ghouls. But friends, I want to tell you about a free streaming service that’s in many ways just as good as Filmstruck, offers Criterion films, and has at least one feature that no one else does. Kanopy is not new, it got its start in Australia a decade ago and has slowly expanded its services around the globe. Its business model is to partner with universities and public libraries which then offer students and members the ability to stream the service’s library of 30,000 films for free. Some 4,000 public libraries worldwide use the service, so there’s a decent chance you have access through your local system. Why haven’t you been doing this? I don’t know. Why haven’t I? I couldn’t really tell you! But it’s very good. I think the biggest reason Kanopy isn’t a household name is that association with libraries. Public libraries are great and offer all kinds of digital options that you may not be aware of. So if you don’t have a library card that’s the first step to signing up. In New York City, where I’m located, you can sign up for a library card online. It’s been a while since my last library visit and getting set up on Kanopy meant that I had to revisit an old feeling from the Blockbuster Video days—cleaning up late fees. It did not inspire even the mildest hint of nostalgia. But there will be no late fees for your streaming, so stay with me. Once your library card situation is in order, you just go to Kanopy’s website or download its app and sign up. You’ll have to choose your local library, enter your card number, and verify an email. It’s easy-peasy. You’re still not doing yet, are you? You’re still thinking this sounds like a nice thing that you’ll get around to later and you’re going to go home later only to aimlessly scroll through the same watchlist on Netflix that you’ve been staring at for five years. I urge you to just take the plunge. I subscribe to pretty much every streaming service under the sun and use PS Vue for cable. But logging into Kanopy I immediately saw selections that either don’t pop-up in my regularly scheduled, algorithmically-generated hellscape. There’s a boatload of classic films like Metropolis and Sunset Boulevard for the Filmstruck crowd. There are 50 movies from the Criterion Collection to tide you over until its new streaming service starts next spring. And there are a lot of new flicks spanning all genres. We don’t know when Apple’s long-delayed streaming service will debut but last month it made a big deal out of its new agreement to produce flicks with the hot indie studio A24. Right this second, you can watch A24's back catalog on Kanopy, including films like Ex Machina and current awards-competitor First Reformed for free. Maybe you have kids. Do you have any idea what they’re watching on YouTube? I swear to you it isn’t good. Kanopy has a whole kids section with old and new classics that do not feature a CG doctor impregnating Spider-Man with a syringe. What many would consider Kanopy’s only flaw is what I believe to be the best thing that sets it apart. You have a limit of how many films you can watch in a month and a limit of how long you have to finish a given film once you’ve started. Kanopy gets paid by its institutional partners for each film that a member streams. The university or library set their own streaming limits for members and can adjust them based on increased activity or budget changes. The Brooklyn Public Library gives me a limit of six films per month and I have three days to finish a film once I’ve started. The counter restarts on the first of every month. Kanopy isn’t a Netflix killer, it’s a nice additional service. Of course, if you don’t subscribe to any streaming channels, it’s a great option. But I like that you need to think about what you want to watch. Instead of getting 15 minutes into something and changing your mind, maybe you’ll stick it out. If you fell asleep halfway through a film, maybe you’ll be sure to finish it the next day. In other words, it’s much closer to the old video store experience when you actually cared about your choices.